Since our first vintage in 2001, Migration has developed a refined and compelling style that balances vibrancy and finesse. Defined by the idea of movement, Migration is dedicated to going beyond our Anderson Valley origins and exploring Pinot Noir and Chardonnay from the finest cool-climate winegrowing regions. This exploration has taken us to the hillsides of Dutton Ranch in the heart of Green Valley - the coolest and foggiest part of the Russian River Valley. 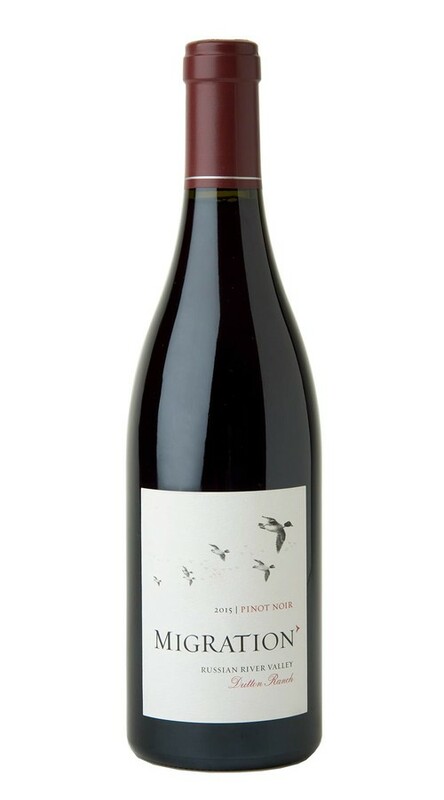 At Dutton Ranch, ideal Goldridge soils, and a mix of elite clones, produce a complex and aromatically driven wine with bright cherry, cranberry and red raspberry layers, supported by beautiful acidity and sophisticated notes of Asian spice and earth. Concentrated notes of sour cherry, cranberry and cinnamon spice rise from the glass of this intensely aromatic wine. On the palate, bright acid provides a lovely structural base to support the vibrant red flavors, with more savory elements of mushroom and moist earth adding to the complexity of the finish. 2015 provided another banner year for Chardonnay and Pinot Noir in the Russian River Valley and throughout California. While warm winter weather led to an extremely early budbreak, a cooldown in spring resulted in some shatter, which in turn lowered yields. While the early budbreak led to one of our earliest harvests on record, because the season started so early, the grapes still had ample time to achieve ideal ripeness. Just as important, the somewhat smaller crop combined with ideal even weather during ripening yielded wines with exceptional concentration, as well as beautiful poise and fruit purity.